Start reading My Secret Rockstar Boyfriend on your Kindle in under a minute. An irresistible romance is perfect for anyone who has ever had a celebrity crush (everyone). 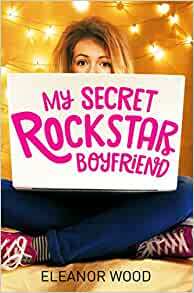 Eleanor Wood is the author of Becoming Betty and My Secret Rockstar Boyfriend. Her work has been published in various magazines and on websites, most recently Elle magazine. Her erstwhile lo-fi fanzine, Shocking Blues and Mean Reds, won praise from the Independent, Lauren Laverne, and Marmalade magazine, among others. She lives in Brighton, blogs about music (among other things), has a Leonard Cohen tattoo and would like to get a cat, but isn't sure she can handle the commitment. 5.0 out of 5 starsReal page turner and fun, engaging modern tale! I was hooked by the premise of this book and it was a really engaging page turner until the end; I was very invested in the well drawn, relatable main character and dying to know how it all ended for her! The use of blogging, music and music festivals was a great fun touch and I love that the idea from the book came from a real life crazy experience with a celeb (be sure to read the epilogue). All in all, loved it and would recommend! I loved this book so much, I fact I feel a little sad and lost now I have finished it. The characters are all loveable and I really cared about them, especially, the main character, Tuesday. This is written in a beautiful way and really is a must read. I think I will be reading it many more times. Best teenage novel I have ever read. Really funny and well written. Loved how addictive it was! Easily draws you in to the heady and complicated teenage world of head-over-heels crushes and rule-breaking tastes of freedom. 5.0 out of 5 starsBrilliant, loved it! What girl wouldn't love it. I honestly couldn't put it down, kinda sad i've finished... What next? 4.0 out of 5 starsFestivals, gorgeous rockstars and blogging rolled into one UKYA novel. What more could I ask for? Another festival book, yay! I’m loving books with festivals in at the moment, particularly the amazing Remix by Non Pratt, so I was excited to get stuck in and read My Secret Rockstar Boyfriend. This was a book I stumbled across at the library and picked up on a whim - and I'm so glad I did! Eleanor Wood has done a brilliant job of writing a fun, romantic, quirky novel about an ordinary girl who meets a superstar band member. Tuesday and Jackson end up in a complicated situation where fame and normality collide, resulting in a story far more poignant than I would have expected. I laughed out loud on more than one occasion and had a lump in my throat during the darker moments - this YA book had it all. If you love books about bands, you really need to give this one a try.